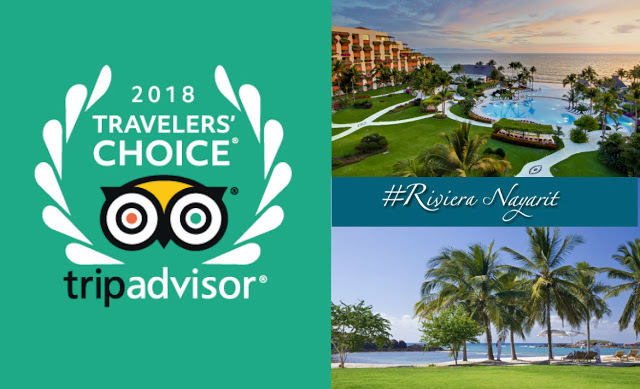 TripAdvisor, considered the largest travel website in the world, has published its Travelers’ Choice 2018 where tourists select the top 25 hotels in different categories to spotlight the best in tourism, and the Riviera Nayarit hotels have their place among the best in Mexico and the World! The Riviera Nayarit hotels are included in the World's Top 25 All-Inclusive Resorts, and in Mexico's Top 25 lists: All-Inclusive Resorts, Hotels, Luxury Hotels, Hotels for Service and Hotels for Families. The Grand Velas Riviera Nayarit Hotel is listed among the World's Top 25 All Inclusive Resorts. Hard Rock Hotel Vallarta is included among the Top 25 All Inclusive Resorts - México. Among the Top 25 Luxury Hotels - Mexico you can find The St. Regis Punta Mita Resort, Grand Velas Riviera Nayarit and Four Seasons Resort Punta Mita. Playa Escondida in Sayulita is included in the Top 25 Hotels - México. Dreams Villamagna Nuevo Vallarta, The Grand Mayan Nuevo Vallarta and Mayan Palace Nuevo Vallarta are listed in the Top 25 Hotels for Families - Mexico. As part of their promotional efforts, the Riviera Nayarit Convention and Visitors Bureau (CVB) and the Bahía de Banderas Hotel and Motel Association lend their support to sports competitions, conventions and cultural activities; these activities showcase the destination by generating visitors and major exposure thanks to the media coverage they receive. This work is done with the support of the Government of the State of Nayarit via its Tourism Promotional Trust (Fiprotur).